Oranges are loaded with essential nutrients and make an excellent addition to any healthy meal plan. Knowing more about the nutrition content of oranges may motivate you to add them to your daily menus. One cup of a regular orange (cut up into sections) provides you with 85 calories. 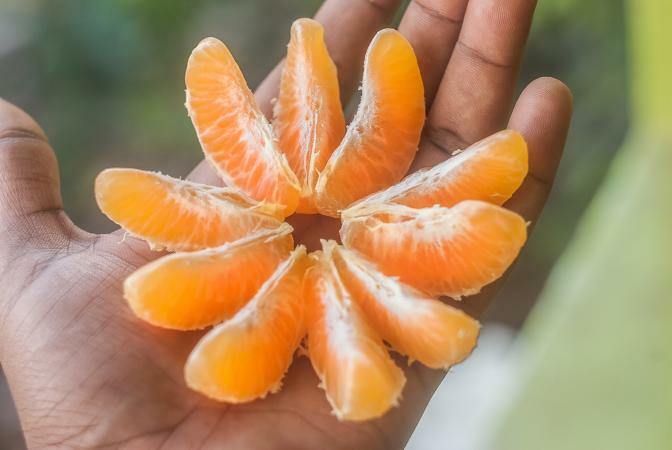 The same portion of an orange contains 1.7 grams of protein, 0.2 grams of fat, 21 grams of carbs, 4.3 grams of fiber, and 17 grams of natural sugar. What Vitamins and Nutrients Are in Oranges? Vitamin C is the main micronutrient oranges provide. Other vitamins and minerals found in oranges include phosphorous, potassium, magnesium, calcium, folate, and vitamin A. The chart below compares the macro and micronutrients of different types of oranges (for 1-cup portion sizes) based on information provided by the U.S. Department of Agriculture's National Nutrient Database. All types of oranges, tangerines, and citrus juices contain essential nutrients and are similar in content nutritionally. Orange juice is the highest in vitamin C and potassium but also contains the most calories. Raw oranges provide fewer calories (and more satiating fiber) than juices and are generally the better choice.